"Easy mac and cheese that lets you mix all sauce ingredients in the blender, then pour onto cooked macaroni and bake. No need to mince onions or melt cheese in saucepan. You can heat the milk in the microwave. Very easy and quick!" Preheat oven to 350 degrees F (175 degrees C). Butter a 2-quart casserole dish. Bring a large pot of lightly salted water to a boil. Add macaroni and cook for 8 to 10 minutes or until al dente; drain well and pour into prepared casserole dish. Meanwhile, place the Cheddar cheese, hot milk, flour, onion, Worcestershire sauce, pepper, salt, mustard powder, and garlic powder in the bowl of a blender. Blend until cheese is melted and onion is finely chopped. Pour cheese mixture over macaroni. Sprinkle top with wheat germ and Parmesan cheese. Bake uncovered for 30 minutes. 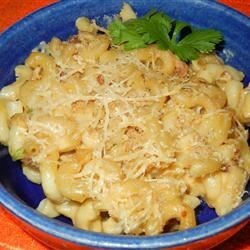 Crunchy breadcrumb topped mac & cheese & bacon! The flavor is good, but not very cheesy. I doubt I'll make this again. I think I'll mix some tuna into the leftovers. Quick and easy. Added a minced jalapeno and some chopped cooked bacon to the macaroni mixture. Needs more sause and it wasn't very cheesy. Nobody enjoyed it. i will not make this again.